AEDs are so simple, they can be used by virtually anyone. You do not need to be a medical professional! Every AED walks a rescuer through the event, from the time the AED is turned on until EMS arrives, using both visual and voice prompts. 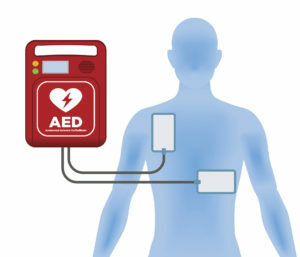 Simple graphics on the AED, electrode packaging (which varies by make and model), and clear voice commands guide the rescuer through the event. “Shock advised” – The AED has detected a shockable heart rhythm and is getting a charge ready to shock the patient. The AED does not have a shock button and will deliver the shock when the countdown finishes. “Shock delivered” – the shock was successfully administered to the patient. “It is now safe to touch the patient” – you can safely touch the patient. To perform CPR on the patient, interlace your fingers and press hard on the lower half of the sternum (breastbone); you may hear ribs crack or break – this is normal and necessary to reach the proper depth!